Active Projects: The Great Repaintening! - follow along on my journey to repaint a Blood Ravens army. | Adeptus Titanicis: Legio Metalica - a slow-grow plog of tiny titans and tinier knights. Deathwatch even more useful now. I was feeling bad about not having enough Repulsors for all my Intercessors and Hellblasters and was considering giving some of them Stalker bolt rifles for backfield objective camping ... now I can just stick with Bolt rifles and leave them behind without feeling bad. Nice. So which vehicles do we think benefit most from this change? Land Raider Crusaders are an obvious pick, but what else? Ironclad Dreads can take Hurricane bolters but I'm not convinced it's worth losing out on the second CC weapon for that extra attack. LRC for sure, Stormraven with Hurricane Bolters as well. Also any vehicle with Stormbolters like Rhinos, Redemptor Dreads and Repulsors. Las-Tacticals get a nice little boost! Let's keep in mind this is a beta rule to represent the training and transhuman nature of the Astartes and how they can wield this weapon with deadly skill. 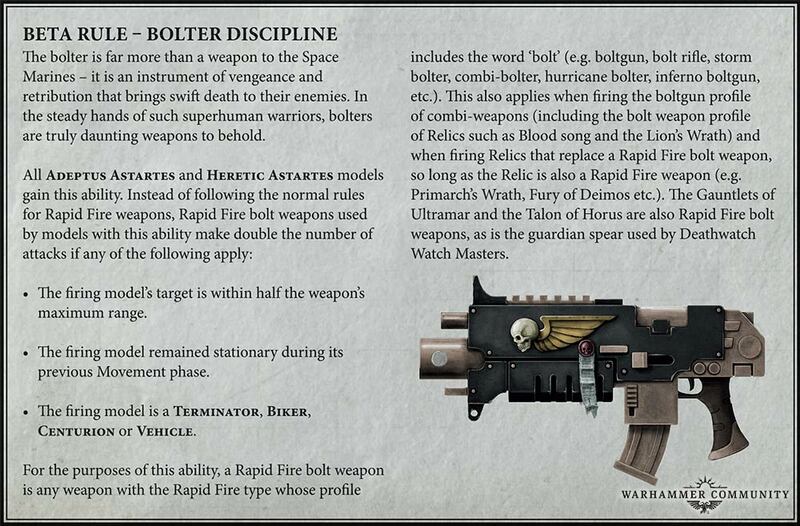 This is not a new Bolter profile, it is not an upgrade to Bolters, it's an Astartes ability. As such other factions that use the Bolter should not recieve this benefit. I'm looking forward to further old solutions to old problems. I remember the terror of AP -2 Shuriken Catapults. Considering Divine Guidance went from "one unit shoots again once a turn to "one unit gets +1 to-hit once a turn" I absolutely fail to see how this is acceptable as an army-wide ability yet old Divine Guidance is busted. And before anyone brings up Vessels, Vessels is a trap and better of being ignored or completely removed at 3CP. Edited by taikishi, 21 January 2019 - 06:21 PM. My Fallen are sad. They are already made for the "stationary 24" gunline" style, and this might have bumped them into usability. Hopefully they get added in before it goes live. Sure, but it really wasn't often that Vets weren't already in rapid fire range anyway. Intercessors with rifles and no other Primaris will now be stronger obsec backfield units, but that's ignoring one of the best benefits of DW in mixed squads. Bike units as skirmishers is more viable now that they can stay at range with maximum output, and the Corvus is a slight bit more deadly now. Edited by Lemondish, 21 January 2019 - 06:35 PM. This section is about Beta rules and for providing feedback explictly as outlined here. Please can we stick to the remit of the section. Thanks. Yup, the only question that remains is do you do stormbolters and stormshields or regular bolters and stormshields to save points. I hadn't thought of bikers but I'm still a little hesitant. They seemed so bad before. Will always rapid ride really be enough? With SIA things are always better but, I'm not so sure. Edited by Raven1, 21 January 2019 - 08:07 PM. Always Stormbolter if you can I'd say. Doubling your damage output for 2ppm is kinda a nobrainer if you have the points. I don't think I'd use regular Biker but DW Biker at least seem decent with the Bolter Discipline rule. They won't suddenly turn into heavy hitters or anything but I think they now might be able to pull their weight damage-wise while utilising their speed for more than just getting into rapid fire range real quick so it's at least worth a try I guess. From the Grey Knight perspective, this seems like a nice bonus, particularly for Terminators and Paladins, but it erodes even further the slim advantages the Psycannon and Psilencer had over the stormbolter. I know I have already emailed GW about it, but I'd suggest all other sisters and/or Custodes players send an email. There's no reason a sister or a 'stode shouldn't be able to effectively use their weapons. It’s not a bolter rule. It’s an astartes rule. A sister doesn’t have the training/implants an astartes does and Custodes have different benefits in different areas. Going by your argument, a marine player has a right to acts of faith benefits because they are equally as pious/covered in purity seals. Except their not -- Marines lost half to chaos. Sisters lost a handful, and are more plentiful than Marines by a long shot. Sisters use the same technology and train just as well as the Marines. Also, Custodes are just as intense as Marines in training, so why wouldn't they get Bolter rules? Sisters use the same technology and train just as well as the Marines. Flatly untrue. While Sisters do use Power Armour theirs is quite simply less powerful since they do not have the implants (Black Carapace) to integrate with it in even vaguely the same way. Hell, Astartes can 'feel' through Power Armour. Further, Sisters are literally human. It's one of the things that makes them badass, but they functionally cannot train as hard as Astartes who can operate effectively for weeks without sleep, and we know from the lore that Astartes downtime (particularly sleep) is minimal in the extreme. Isn’t this just a case of the rich get richer? you also get a descending list of how much benefit each type gets. That is, the stronger the weapon was, the more it benefits. Isn’t that the exact opposite of how buffs should work? Don’t get me wrong, it’s great that Marines are getting buffed and that it’s being done in small increments rather than leaps and bounds. But if this rule had been posted on this or another forum as a proposed rule it wouldn’t have survived the first page before being ripped to shreds as a terrible idea. Sisters are no way near the skill level of a marine. One is a genetically engineered machine engineered for war in human form the other is still human but with strong beliefs. Marines have faster reaction etc meaning they can track, fire and reload quicker. This represents it nicely. WS 2+/Bs2+ Cannoness vs ws3+/bs3+ stock space marine, so, uh, humans can be better than Marines? There is no fluff argument to say sisters shouldn't be as good as Marines, at least regarding aiming. Like, it's the future, we both have power armor and aiming systems in our helmets and train nonstop. I don't think any of us can get much better at shooting. Edited by Beams, 21 January 2019 - 10:56 PM. It’s no exaggeration to say that a Marine might have spent more time doing bolter drills than a Sister has spent breathing. At some point practice has to count for something. Superior senses aside, Marines have stronger arms, so less recoil and therefore steadier aim. We don't have to get into the nitty gritty of real life guns, here. It's gun fantasy and in gun fantasy, bigger arms can hold bigger guns. We already have humans from Rambo Planet being as strong as Marines and humans who Faith Really Hard being able to wear armor made for Marines (I am fine with both of these, by the way). Let us have one single things that the supermen of the setting can do better than humans. Really...You must realise tt is an abstract and not a good argument to take. In the lore a marine is massively superior to a baseline human. Hence why sisters dont get access to this beta rule. It is meant to represent the superior physiologically nature of astartes in an abstract nature due to the lack of granularity on the tt. Furthermore it helps balance the main (from gws perspective) faction to make them slightly more competitive. Edited by Subtleknife, 21 January 2019 - 11:19 PM.